The group of Julien Laurat from Laboratoire Kastler Brossel has recently published interesting results where by using arrays of individual caesium atoms trapped along an optical nanofibre, they observed a single collective atomic excitation coupled to a nanoscale waveguide. 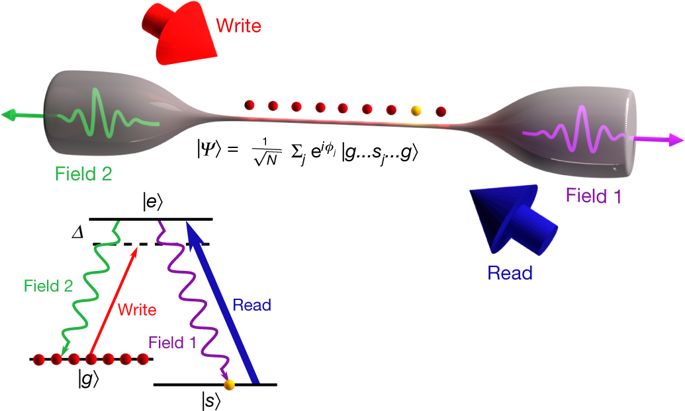 The stored collective entangled state can be efficiently read out with an external laser pulse, leading to on-demand emission of a single photon into the guided mode. They characterize the emitted single photon via the suppression of the two-photon component and confirm the single character of the atomic excitation, which can be retrieved with an efficiency of about 25%. The results demonstrate a capability that is essential for the emerging field of waveguide quantum electrodynamics, with applications to quantum networking, quantum nonlinear optics and quantum many-body physics. Via an external write pulse on the |g⟩→|e⟩ | g ⟩ → | e ⟩ transition, a collective entangled state with one ‘spin–flip’ excitation is created.